40% of Skype for Business customers are now using the platform for voice communication, and many of these customers are now considering complementing the deployment with or shifting to Microsoft’s cloud suite, Office 365. When migrating to Office 365 cloud voice, customers should evaluate whether their existing audio devices are compatible or whether new technology will be needed. 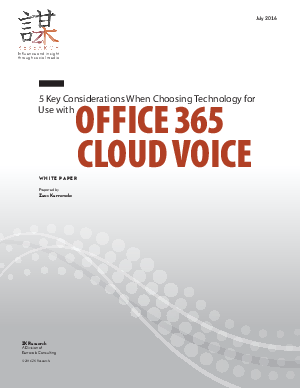 If you’re thinking about making the switch to cloud voice, download the report for the 5 Key Considerations when Choosing Technology for Use with Office 365.